This marine park is also known as Port Blackney. The excellent all-weather anchorage and sheltered inside route provides protection for small boats. There are no landing docks or other facilities. Park Size: 26 hectares of marine area and 48 hectares of land area. Closely follow marine charts, as there is a risk of hitting a large rock on the south entrance to the cove. 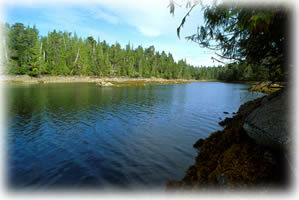 Oliver Cove Marine Park is at the south end of Don Peninsula near the junction of Milbanke Sound and Mathieson Channel. Refer to Canadian Hydrographic Charts 3710 and 3728. The park is accessible by boat only. The closest communities for supplies are Bella Bella and Shearwater. History - This park was established in 1992. Cultural Heritage - This park is within the traditional territory of First Nations people. Wildlife - As you cruise through the waters near the park, watch for orcas, Pacific white sided dolphins, sea lions and other marine mammals. Enjoy identifying the weird and wonderful creatures of the intertidal zone when the tide is low – sea cucumbers, nudibranchs, chitons, sea stars, molluscs, urchins and multicoloured algae. Please look, but do not disturb them or move rocks. On shore, watch for Columbia black-tailed deer, mink, black bear and wolves. The area surrounding the park is very popular for fishing, though the park itself is not a fishing destination. The park and entire North Coast area are closed to harvest of bivalves. Anyone fishing or angling in British Columbia must have an appropriate licence. Swimming is possible from your boat, but the water is cold all season long. There are no lifeguards on duty at provincial parks.